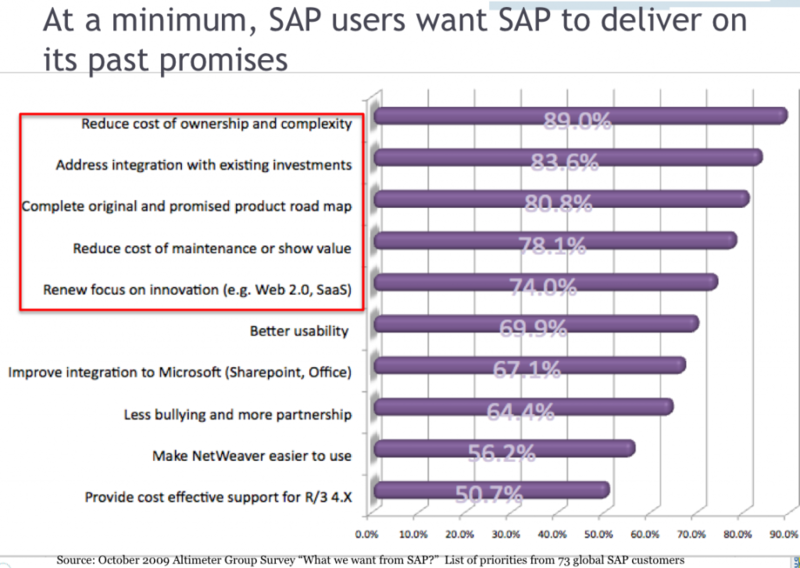 A show of hands in the audience validates conversations that SAP users have not adopted NetWeaver, Duet, ByD, Solution Manager, and Enterprise Support. SAP users and their user groups have a unique opportunity to put in the right infrastructure to engage in productive partnership with SAP. The management team has shifted their outlook. Early signs indicate a more customer focused approach may be on the way. Customers seeking to innovate within their SAP investment should ask hard questions about what is in the SAP Labs portfolio. User groups will play a key role in helping to prioritize future SAP product road map investments. Users and their user groups should push for frameworks that monitor customer reuqests and increase transparency in the prioritization process. Customers can not allow SAP to squander any more of the 10’s of billions in maintenance fee and license fees “invested” with SAP. When will you migrate to BS7 or ECC 6.0?